We spent Memorial Day weekend up in the Catskills and stayed at a great Bed & Breakfast in Phoenicia. We're not usually the Bed & Breakfast types, but we really loved the Phoenicia Belle. The house is a beautiful Victorian that has been lovingly and artfully restored by its owners, Tom and Dana Fraser, who are also the most gracious and kind hosts you could ever hope to meet. Tom and Dana are both very knowledgeable about the area and it was a real pleasure to make their acquaintance. Silas loved Phoenicia as well. He had a great time playing in the Esopus Creek, which runs through the town, and loved watching all the fire trucks in the Memorial Day parade. He wasn't super fond of the caterpillars and other bugs in the great outdoors, but that's because he's a city kid and the only bugs he's seen are cockroaches. 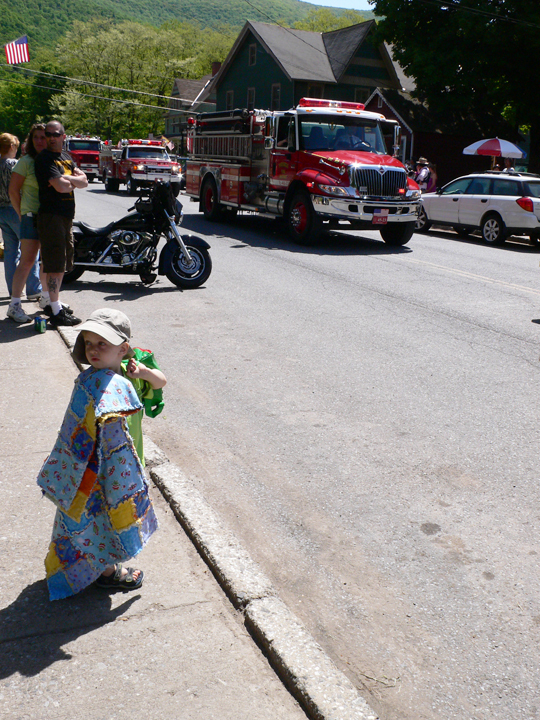 Silas watching the Phoenicia Memorial Day Parade.